Well... actually it was not mine but from my university, but I used for my master thesis and I showed him how to move from scratch. The details on the mathematical calculations and code implemented is detailed on my thesis. You can find it here (it´s in Spanish). 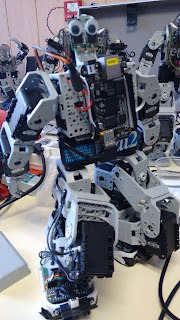 Bioloid robot with a BeagleBone Black board on the chest. My thesis objective was to develop the Locomotion libraries (in an API) for the robot to move, that is creating from scratch all the movements on the robot in order to have some high order instructions like the proprietary software have. 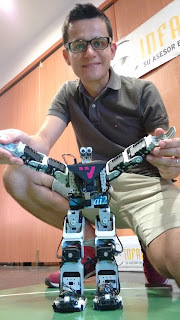 That's me with my robot. The first thing I did is that I used the code created for a single robotic arm (see previous post) and used for the two arms in the robot. 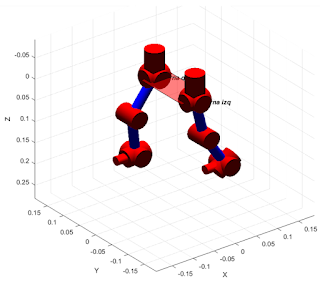 For the legs to move I programmed the kinematic equations that describe the movement of the foot using hip as a reference and the equations that describe the hip movement using foot as a reference. The reason to have 2 sets of equations for the legs is that for example walking is divided in two main phases: foot on ground (here you move the hip) and foot on air (here you move the foot). Likewise I created two linear trajectories generators, one for the foot and one for the hip. Both were generate movements in straight lines since it´s important to control on every moment were the foot and hip is, and avoid this way any possible unstable position. Matlab simulation of the legs as kinematics chains. This time for the communications from the BeagleBone Black to the servos (Dynamixel bus) I used an USB2Dynamixel device. The low level drivers for the BeagleBone Black to send the Dynamixel data frames was created by David Cisternes as a generic API for communications on a Dynamixel bus. Next task was to create those high level movements everybody loves, so for example for a movement "one step forward" I divided the movement into 7 different segments: lean sideway, lift foot, low loft, move hip forward and sideway, lift back foot, low back foot, return to normal position. Then I created the trajectories for all the limbs during each segment. This duty required a lot of trial and error correction to reach a stable movement. Robot during one the segments of "one step forward" movement. I called this high level movements as "behaviors" in order to be used on a state machine that ruled the robot logic. 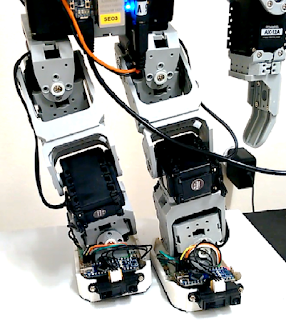 The robot would move between behaviors based on the input from sensors, in my case the ones implemented on the smart foot (see previous post). Finally the robot was able to climb or descend stairs (not big ones, it was a small robot after all! ), walk forward and make small turns to the right or left.